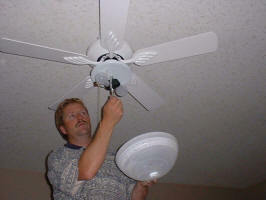 This article provides a step-by-step guide to installing a ceiling fan. 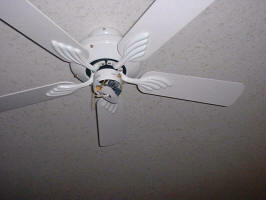 Ceiling fans contribute to the temperature control in a house, and add a decorative touch to a room. 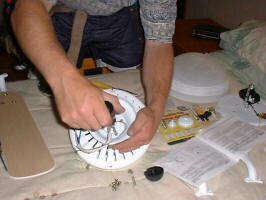 Installing a ceiling fan may appear to be an intimidating project, but with the right instructions, the proper tools and time, it can easily be accomplished. It begins with one or two innocent boxes …. not too intimidating, right? Your perspective may change, however, upon emptying their contents. 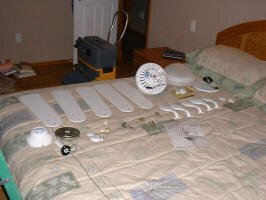 Fortunately, ceiling fans come complete with instructions, including an inventory/parts list that will identify each of the components that you’ll be working with. This is the gem we’ve been living with since construction (electrician’s houses are notorious for unfinished electrical). Obviously, you must first remove the old fixture. Ensure you have the power to the light source you will be working on disconnected. 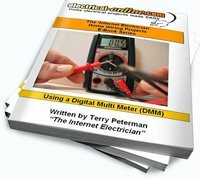 As a safety precaution, use a circuit tester to confirm that there is no power to the circuit. Take note of which wires inside the outlet box are connected to the original light fixture. In our case, the outlet was pre-wired and switched separately for a light and a fan combination. We had a neutral (white), a black (hot) wire from the fan switch, and a red (hot) from the light switch, all in a 3-wire cable with ground (bare/copper). Some fan blades are reversible (as shown in Figure 5). 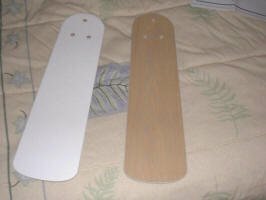 Select the desired color that you wish to be exposed and mount the brackets to the blades as per instructions provided by the manufacturer. Typically, this involves a three-bolt system, each insulated with fabric washers. 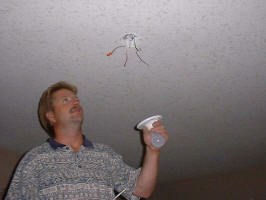 Installing a ceiling fan is a great “two-man” project. As seen in Figure 6, a capable assistant can mount the blade hardware, while you proceed with step 4. 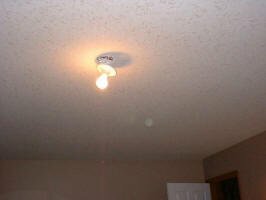 Depending upon the height and slope of your ceiling (as discussed earlier), you have the choice of either a ceiling hugger or the down rod option. For this project, we are using the ceiling hugger option and thus the canopy mounts directly to the motor assembly without using the down rod (See Figure 7). Review the instructions provided with your fan. Before getting to this step (Figure 8) you must ensure that the outlet box is securely mounted to the wood structure of the trusses or rafters. If at all unsure, you should go into the attic and add whatever bracing is necessary to ensure the box is mounted solidly – it should be able to support your body weight. In this case, we knew we were mounting a ceiling fan at this outlet, and the box was properly secured during original construction. Our ceiling fan has a green, white, black, and blue wire. The instructions provided with our fan indicated that the black wire was for the fan, and the blue wire for the light kit. 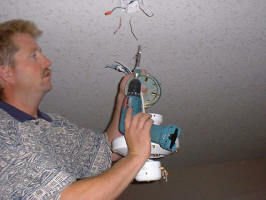 Hang the motor assembly on the hook provided, and make your wiring connections (refer to the instructions provided as they may vary). With our fan, it was green wire from the fan spliced to the bare copper wire (ground), white fan wire spliced to white wire, and black fan wire to black wire, and the blue wire from the fan light kit to the red wire (see Figure 9). 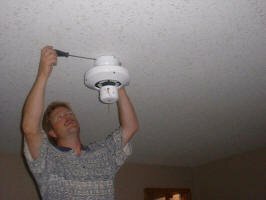 Before you finalize installation, it would be wise to test the connections to make sure that you have electricity to the fan, and that the connections are all in order. Again, follow all safety procedures when returning power to the fixture and testing. Tuck your splice up inside the junction box and secure the mounting plate to the outlet box (Figure 10 & 11) using the appropriate mounting screws (usually provided, but ensure that they are sized to support the load). Next, mount all of your blades, following the instructions provided. Ensure that the screws are tight so you avoid the “multiple boomerang” effect! 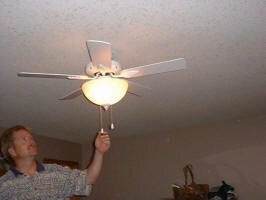 As you can see from Figure 12, your head can serve to steady the fan blade (an old electrician’s trick) while you attach it. Remove the light kit cover (Figure 13) and assemble as per instructions provided. Generally the wires are provided with plug-in connectors. Connect your wires together and install your light kit (Figure 14). Now you’re ready for your bulbs. Check bulb type and maximum wattage rating of the fixture. Do not exceed manufacturer’s ratings! Mount the globe (Figure 15) or glass fixture to complete the project (see instructions provided with your fan). 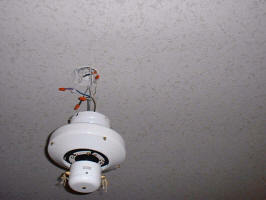 In this case, the pull chains for fan speed and direction and light switch had to be fed through corresponding holes in the globe. 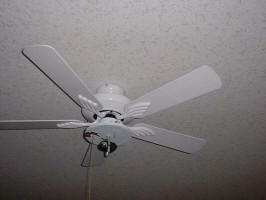 There you have it, a beautiful, quiet, cooling ceiling fan. 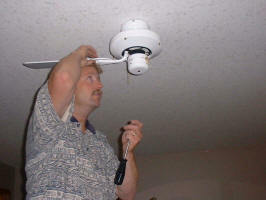 The installation of the fan took us just over one hour to complete, and without any undue stress. Take your time, read the directions, lay the components out in order and I’m sure things will run as smoothly for you! 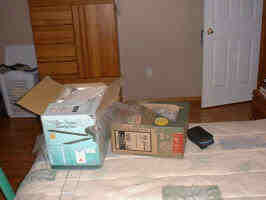 This entry was posted in Home Lighting, Lighting and tagged blade hardware, ceiling fan, ceiling hugger, circuit tester, fan, fan blades, hot to install a ceiling fan, installing a ceiling fan, light fixture, light kit, light source, wiring a ceiling fan. Bookmark the permalink.